How much better would your life be if you had an army of Nobel Laureates, MacArthur ‘geniuses’ and National Medal of Science winners whispering tips in your ear about your body language, or how to resist that impulse purchase you’ll regret tomorrow, or when to sell your car—or even helping you trick your spouse into doing the dishes? With this mighty little tome, you can have the next best thing--because Brain Trust is packed with bite-sized scientific wisdom on our everyday challenges, hand-delivered to you direct from the galaxy’s biggest brains. 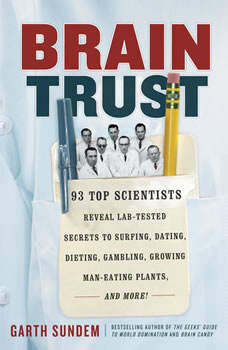 Based entirely on interviews with an incredible lineup of luminaries from the fields of neuroscience, economics, anthropology, music, mathematics, and more, Brain Trust is full of cutting-edge science that’ll help you see the real world better—and smarter.